This is the framed art piece we made for our Christmas Classes this year. The PDF will give you instructions for each panel. I suggest that you buy your frame and place the Real Red background card into the frame before attaching the panels. This is the Christmas Ornament we created this year at my Christmas Class. We also created a presentation box for the ornament, which makes it easy to gift. Download your free tutorial here. Here is the last project for 2018’s Christmas Classes. The fold was shared on a Demonstrator only Facebook Page by Julie Burt. With her permission I share the instructions with you. Mini Pizza Box and 3″ x 3″ cards. This is the last project we made at Beachmere and the ladies loved it. 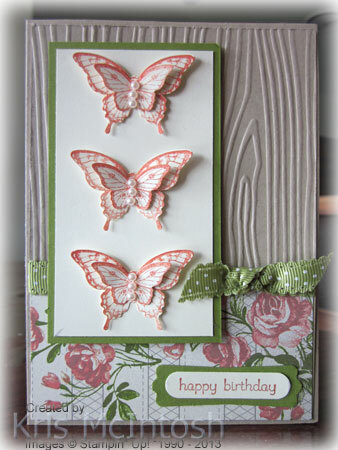 You could easily change up the stamp set to create something similar with what you have at home. This Framed Art piece was created for the All Day Class at Beachmere in November 2017. You could easily change up the stamp sets and dies for any of the panels if you do not have the sets that I have used. Click here to download your Free Tutorial. This ornament is part of the Be Merry Kit from the 2017 Holiday Catalogue. 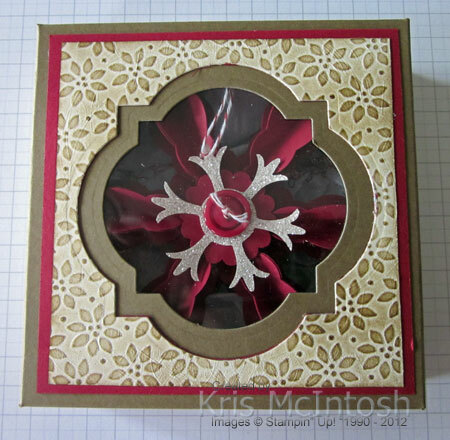 The ornament is placed into a Presentation Box using the Merry Music Designer Series paper. This type of Gift Card Holder have been around a long time. This is my version which we made at out All Day Class at the Beachmere Retirement Resort. I hope that you find this tutorial useful. This is the tutorial for the framed Christmas art work that I created for my All Day Class at the Beachmere Retirement Resort. I hope that you enjoy creating your own Framed Art Piece. I found this 6″ x 6″ One Sheet Wonder on Pinterest by Sylvia Durocher and was so happy to be able to cut into my Designer Series Paper without wastage. I created this set of cards using the Cookie Cutter Christmas Bundle and the Candy Cane Lane Designer Series paper. This luminary was created after seeing one on Pinterest by Debra Smart. I created the tutorial for my all day class at Beachmere Retirement Resort. I haven’t added the steps to line the luminary, sooo…. just before you close the Window Frames together to create an open box, add an additional Window Frame to the inside of the box so that there are no rough edges showing of the embossed Vellum. You will need to trim the frames down a little to make sure that it will still fold well. I hope you enjoy making this Luminary as much as I did. I am going to make several more for our Christmas Table this year. Click to download your free tutorial. This project was created for my all day class at Beachmere Retirement Resort. I hope that you enjoy making this piece to display with your Christmas Decorations this year. This is a project that I created as a special request for a customer. I hope that you enjoy making this as much as I enjoyed creating it. These days most couples getting married already have most things they want so this is a great way to give a voucher or cash. I have had lots of requests for the instructions to make this cute little gift box. It can be used to hold a gift just like the one below. 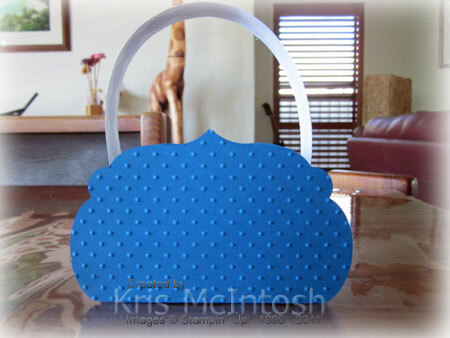 Or you can use it to hold Christmas Cards and give it as a gift. I think these would make fabulous Teacher Gifts. 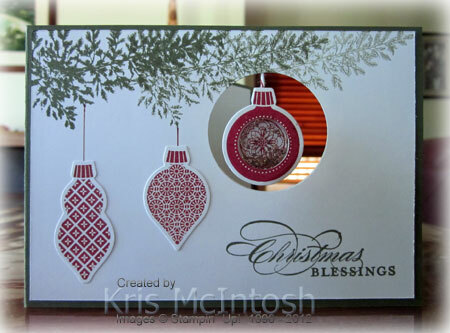 I have included a free tutorial to make the Christmas Cards as well – see below. These are the instructions we used in class to make the five cards that I designed to go in the Envelope Liner Box. I love the way this little chocolate bar holder turned out. You will need to use the small choceur chocolate bars you get at Aldi, they come in a pack of five chocolate bars. This is my framed art piece for Christmas 2013. I hope that you enjoy creating this project to add to your Christmas decorating this year. Click her to download your FREE tutorial. This is a card we made at a recent class. I think the butterflies and roses go together so well. Please enjoy this free tutorial. This tutorial gives you the instructions to make the card but it also gives specific instructions as to how I make my flowers. 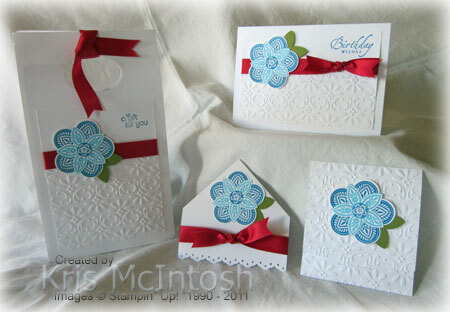 I love to take my punches and die cuts and turn them into gorgeous 3d flowers. I hope that you have as much fun making them as I do. I am especially proud of this Easter Basket as I haven’t seen anything like it elsewhere. I think it is very cut basket and lends itself to all sorts of occasions and embellishment. My tutorial gives you a couple of examples of how I embellished my baskets. I’m sure that you will find lots of uses for this cute little basket. Some of the products used in this class are retiring or have retired, however, they can easily be swapped for items you have on hand. The instructions for most of the items in the Gift Bag can be found in many places on the internet, these are merely my versions. 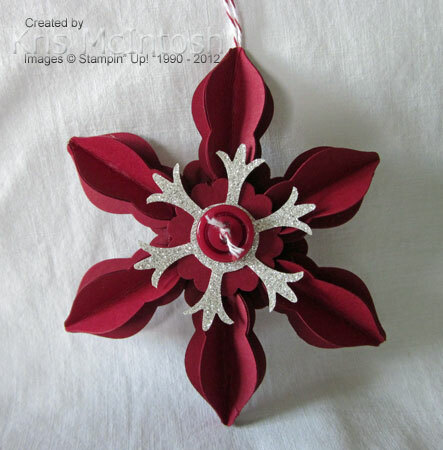 This gives step by step instructions to re-create this Christmas Ornament Shaker Card. This is my version of the Ornaments featured in the Holiday Mini 2012. My tutorial was designed to be made in a class setting, so does not use a hot glue gun. If you have one, it would be a much quicker project to assemble. This box is designed to present your Christmas Ornament as a gift for someone special. Thanks for sharing this tutorial…..
Bellísima tarjeta navideña, estoy segura que formará parte de los tesoros que se guardan para siempre. ¡Felicidades y gracias por compartirlo! Gorgeous Christmas card, I’m sure that will be part of the treasures that are kept forever.Congratulations and thanks for sharing! Do you have a tutorial for the high heel birthday card?